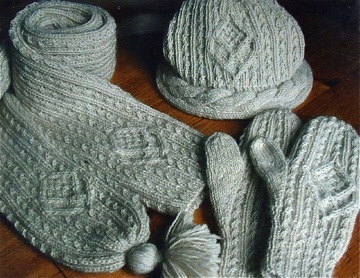 The pieces of this set are knitted primarily of a cabled rib in the round. The finished scarf is 60" and 5-6" wide, the hat is 21.25" in circumference, and the mitten is 8" in hand circumference above the thumb. The scarf calls for 440 yards of sport or a light worsted weight yarn, the hat for 220 yards and the mittens for another 220 yards. We have sport weight yarn in Traditional Colors 100% Wool, Natural Colored 100% Wool, Silk Blend, Cotton Blend or Alpaca Blend.